Reggae Grammy for Ed Sheeran, Chronixx & Sean Paul with Tropical House? During the last weeks, the board of experts working for the Grammy Awards were extremely busy with incoming submissions. Until August 22nd, entries could be submitted. Submissions were screened for eligibility and category placement and then sent on to the Recording Academy Voting Members, who determined the five finalist during the First-Round Voting from Oct. 17 to 31, 2018. The nominations in each category will be publically announced on December 7th. Social media was abuzz with artists' promotion entitled "For your Grammy Consideration…", informing us why their album deserves nomination. The Academy Voting Members can choose from 141 releases applying for "Best Reggae Album" (source: Jamaica Observer), among them Romain Virgo (Love Sick), Etana (Reggae Forever), Alborosie meets The Wailers United (Unbreakable), Protoje (A Matter Of Time), Ziggy Marley (Rebellion Rises) and Sting & Shaggy (44/876), all viable candidates for the prize. An album that also applied and seems to stick out because of the media attention it received is the compilation Tropical House Cruises To Jamaica (Amada Records) - no surprise given that the featured artists include names such as Sean Paul, Vybz Kartel, Damian & Stephen Marley, Wyclef Jean, Chronixx and one of the world's best-selling music artists, Ed Sheeran. After an exclusive introduction and an album premiere by the Billboard Magazine one day prior to its release on December 22nd, 2017, it spent four weeks straight at the top of the US Billboard Reggae Charts in February and March 2018, a fact duly reported by different media houses (e.g. Hush! Mag, News Americas Now). In August, then, we first read about the album being sent in for Grammy consideration, a fact that had aspirations running high from participating artist Sean Kingston: "That's an album that deserves a Grammy nomination and I feel it has what it takes to go all the way." (Jamaica Star, August 17th 2018). 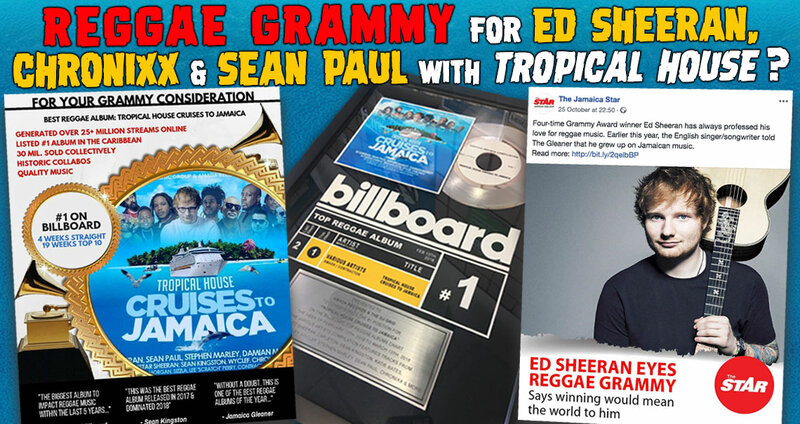 The album’s executive producer Sean “Contractor” Edwards, managing director of Contractor Music Group, told the Jamaica Star that the album was submitted to the Grammy board for consideration as a Best Reggae Album contender and that the submission was accepted. The news got published by Hush!Mag and Irie Jam 360 News, too. In the corresponding article, Ed Sheeran stated: "As huge fans of reggae, it would mean the world to myself and my cousin Jethro to win a Grammy for such a great record with such amazing talent with some incredible artists. I think we should win this Grammy hands down, look at the stats, just listen to the album! It’s incredible and I think it’s the best reggae album that has been released that I’ve heard. It has some of my own and my cousin Jethro’s favorite artists on the album and it’s an honor to be up there alongside such legends." We were not able to find out why, but both articles were removed a few days later. Only the Star's Facebook post is still available and, as you can imagine, the majority of the several dozen comments is not very supportive. So, according to Ed Sheeran, the Tropical House Cruises To Jamaica is the best Reggae Album that has been released? Admittedly, some of the tracks are not bad. Mojo Morgan for instance, with Million $ Check featuring Damian and Stephen Marley as well as Wyclef Jean, and Eaze, a combination with Cookie The Herbalist and the one and only Lee "Scratch" Perry. But does the album on a whole have what it takes to run for the next Grammy Award in the Best Reggae Album category? Is it really "the Biggest Album To Impact Reggae Music Within The Last 5 Years", as Billboard is quoted on the Grammy consideration flyer? By the way, an interesting formulation, given that the Billboard article quoted originally says: "The biggest things that have impacted reggae music in the last five years are the emergence of the tropical house genre and Damian Marley's Welcome to Jamrock Reggae Cruise." #1 The album must be released in a period from October 1, 2017 to September 30, 2018. This requirement is definitely fulfilled, as the album was released in December 2017. #2 The album must belong to the genre Reggae, including Roots, Dancehall and Ska. At least half of the songs' classification as Reggae is disputable. Tropical House as such is defined as "(...) a subgenre of deep house with elements of dancehall and Balearic house" by Wikipedia, and thus it might be better suited for the genre Dance/Electronic, as it is neither Reggae nor Roots nor Dancehall nor Ska. For a thorough discussion of the term in relation to Dancehall culture, watch this conversation of Richie Stephens and Mr. Vegas. #3 The album has to have a minimum of 51% playing time of new Reggae recordings ("new" is defined as material that has been recorded within five years of the release date and not previously released). #4 The album must be available for sale from any date within the eligibility period through at least the date of the current year’s voting deadline (January 9, 2019). At this point, it becomes even more interesting. Obviously the album was recently removed from all digital outlets like Spotify, iTunes, Apple Music, Youtube Music, Deezer, Amazon. The album’s Spotify link is still available via Google, but only 5 of the 15 songs are still active. Likewise, in case you are looking for an MP3 download of the album, you'll be disappointed. Only physical copies are available, if at all. A place to purchase the album as CD is the homepage of Amada Records, which leads to the Amazon Website. Noting "When sold by Amazon.com, this product is manufactured on demand using CD-R recordable media." At the end, it's up to the Recording Academy Voting Members which albums will be nominated as finalists in the Best Reggae Album category. Given that, for the last few years, discussions about both the Reggae Grammy Nominations and the received Awards have been heated already within the genre, adding another dimension with the Tropical House issue might not prove helpful. We just hope that, with the 61st edition of the Grammy Awards, the focus will be laid on nominated albums chosen, works that will duly represent our beloved genre. We are as curious as everyone else who the final nominations (to be announced December 7) will be, and we hold our fingers crossed for all contestants - stay tuned for updates right here! The The 61st Annual Grammy Awards ceremony will be held on February 10, 2019 at the Staples Center in Los Angeles. Stony Hill by Damian Marley won the Grammy in the Best Reggae Album category at the 60th Annual Grammy Awards, which took place in January 2018! Nominees: Chronixx (Chronology), Common Kings (Lost in Paradise), J Boog (Wash House Ting) and Morgan Heritage (Avrakedabra). PS: Our inquiry with Ed Sheeran's management about the authenticity of his statements and his involvement in this project has so far been left unanswered.